Everything looks very good. Thank you! Hello how long does it take to ship the supplies? Always friendly & Helpful. I'm so happy to be a part of a awesome team. 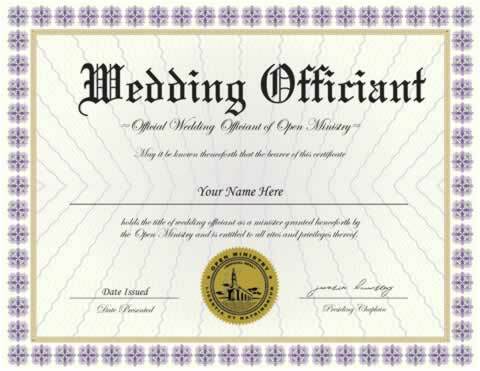 The Wedding Officiant Package is designed for ministers who wish to be recognized as a wedding Officiant. Carry your official Wedding Officiant Certificate and Minister Wallet Card in the certificate holder safely and securely. 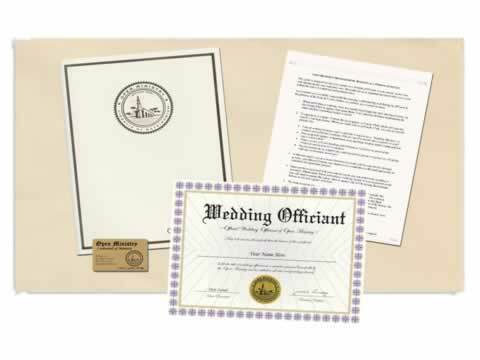 The Marriage Certificate can be given to the couple-to-be as a commemorative gift. Decorated with gold embossed Ministry Seals. 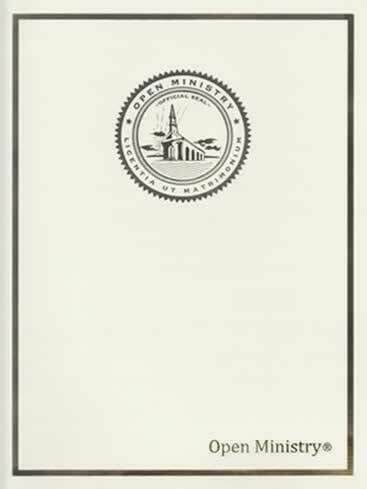 NOTE: You may be required to present an Ordination Credential or Letter of Good Standing to register as a wedding Officiant which is not included in this package. Looked pretty and professional. I was pleased with the marriage certificate as it was for my nephew. Having been an ordained Deacon for years but never having been registered as a legal officiant, when one of my granddaughters requested that I officiate at her wedding, I wanted it to be recognized as legitimate. These credentials satisified the state requirements. In the eyes of the state, I wanted there to be no question. In God's eyes only he can judge. Fast and easy, perfect for my daughter's wedding, where the minister backed out last minute. Thank you, this made her wedding so special for me and for her. I was very happy with the package. The documents where in good condition and all in order. Would recommend and use this in the future, thanks Jonathan. The materials I received are very nice and they arrived very quickly. You made everything easy to do. I web searched several sites and found Open Ministry much more user friendly and more complete in answering all my questions. I am still in the early days so cannot comment yet on the products other than they appear to suit my needs. I didn't get the exact items I wanted via the Wedding Officiant Package, but can easily order those through your website. I should have spent a little more time looking through all the packages and "add ons" first. Not your fault, as you are catering to so a wide variety of needs/wants. The products received are of high quality. Better than local resources. I recommend these products to all ministries. I performed my first wedding on 11-1-14 and it went swimmingly. I used the sample ceremony and write my own. It was perfect. Thank you.